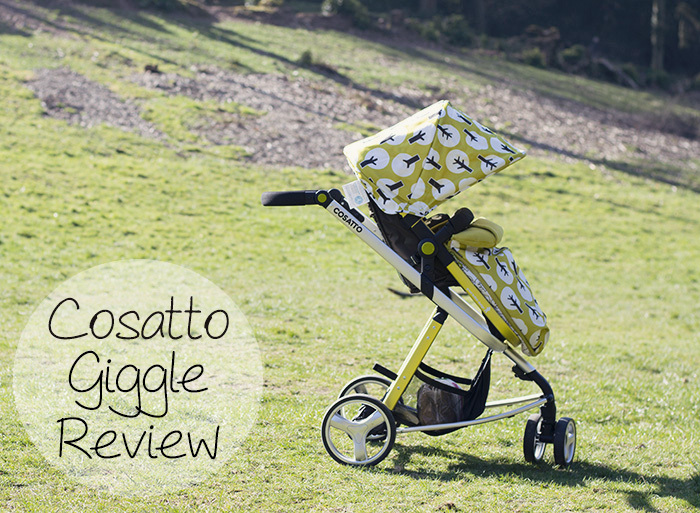 A couple of months ago we were sent a Cosatto Giggle to review and after putting it to the test we have decided we love it! One of the most important things to me when using a pushchair is how easily it folds up and down. I’ve struggled with every other pushchair we’ve owned in this area and it’s a real pain as we keep our’s in the car due to not having much room in the house so I end up having to put it up and down a lot. The Cosatto Giggle honestly folds up and down like a dream. Not only is it easy, it’s so easy that it’s actually enjoyable! It unfolds by just lifting a clip and pulling the handle up and collapses by lifting up a notch and pressing a button, you will see this demonstrated in the video at the bottom of the post. It is SO easy! It’s a good weight too, not too heavy, which is important for me as I have problems with my back. The seat can face outwards or inwards. I didn’t actually realise this to start with so had it facing outwards but now I’ve switched it to parent-facing. Sometimes I do find Tiger is happier facing outwards as if he can see me he wants me to hold him but I love being able to talk to him and see him while walking along so try to have it towards me as much as possible. It’s really easy to switch anyway so we usually end up changing it more than once, obviously take your baby out beforehand! The pushchair comes with a pram unit, raincover, foot muff and changing bag so you don’t need to buy anything separately. You can also buy adapters to attach a car seat to the frame. The Cosatto Giggle seat can be upright, semi-reclined or flat and it’s really easy to adjust, you just push the green buttons in at the side of the seat and move it into position. Cherry is nearly three and half and she still fits in it comfortably which was a very good thing because she’s not much of a walker and moans about being tired after five minutes! But the coolest thing about the Cosatto Giggle by far is the design. It really stands out and makes such a nice change from plain one-colour pushchairs. It’s really eye-catching and we are always receiving nice comments about it. I would really recommend this pushchair, it also comes in lots of other original designs which you can see here. If you would like to see what I did with the box it came in you can do so here – Cardboard Box Doll’s House. And here is a little video I made of our day out with a Cosatto Giggle…. We were sent this pushchair free of charge for the purpose of this review but all the words and opinions are my own.